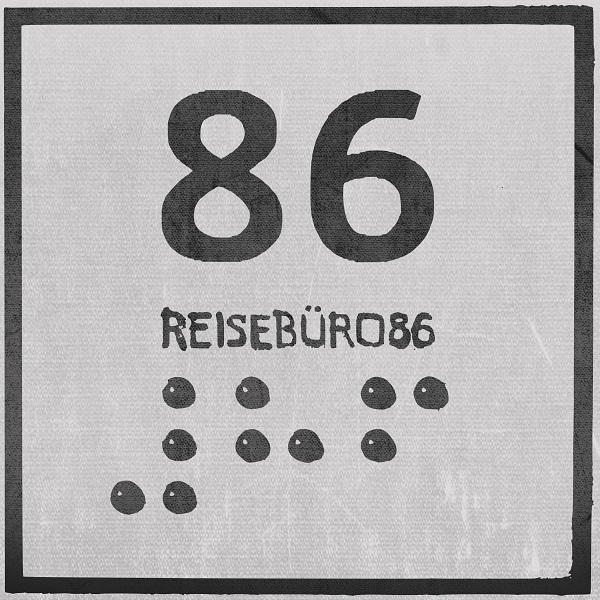 REISEBÜRO86 starts its ’86’ adventure nice deep and dirty. It’s like a being inside a didgeridoo and REISEBÜRO86 actually playing it. The ears might be vibrating from the sound and our stomach flubbers even if we are thin. A good start that only gets better when the album moves to a number named ‘862’. It starts first kind of innocent with a swan like sound that bows its neck before engaging in a massive overflow of delightful distortion. It’s a great day to be crunched! Do you want some milk with that? The number 863 is probably the reason for the genre tag ‘Disco Weirdo’ as it sounds like an okay description for what my ears are inhaling. There is a certain form of humor in this music and the jolly atmosphere in the beginning of some happy folk being played while a dark ritualistic choir hums their depression out of their corner of the track. For a noise orientated adventure this soundscape has a surprising swing to it. 864 goes even so far that it works excellent with dancing. It’s just like these far away images of hidden African tribes that dance on mysterious music, but than futuristic and without the sunshine or singing and spears. The bombastic tribal noise is very deep and dirty but at the same time so pleasantly warm. It’s really a beautiful peace that the last final note that cuts you like a little razor is easily forgiven. The plaster on your new cut is the pleasantly eery work of 865. It takes the time to clean the wound with some anti bacteria water, rubs in the alcohol that might sting a little and then like a professional sticks the plaster over the tormented skin zone. This all goes well together with a fine drone like ambience with soft rasps that keeps us in touch with the feel good side of nature. The fine rolling depth of soothing dark music is every persons wish to receive when going for a visit to your local doctor Doom with the lovely assistant checking you out. A moment of pure relief and happiness can be experienced in 866 that swings like a little dark princess on a horsey. Nice rattle drums, great riddling red riding hood melody and solid enough to withstand the eruption of going for a internal ear check by a gigantic sounding worm that eats all what it can eat. But listening to it eating, you will not feel alarmed and let the worm eat his way in; it’s that pleasant kind of feeling in the skull that makes life all worth it. But like all pleasure bringing ear worms that are rather large, they need to crawl back out again. A operation is not really needed as the fellow will do it all by itself, it might chose another ear than the one it had entered before (giving you all that pleasure), which is actually a generous and polite choice for this creature to do. But as the worm had potentially grown out of its proportions it might be that the friendly sound bringing friend doesn’t fit the express way out of neither ear. Leaving it no choice than eating a tunnel from the inside of the skull large enough to escape and return back in to the outside world. It’s a bit painful for the listener perhaps, but definitely a once in a life time experience. This entry was posted in ambient, audio collage, drone, electronic, experimental, noise and tagged dark Tribal, disco weirdo, Experimental ambient, ritual noise. Bookmark the permalink.